Shaun Empie of NGINX, Inc. Administrators of traditional hardware application delivery controllers (ADCs) are often faced with use cases that the rule sets provided by ADC vendors don’t cover, and certainly not at the necessary fine‑grained level of control over how requests and responses are processed. 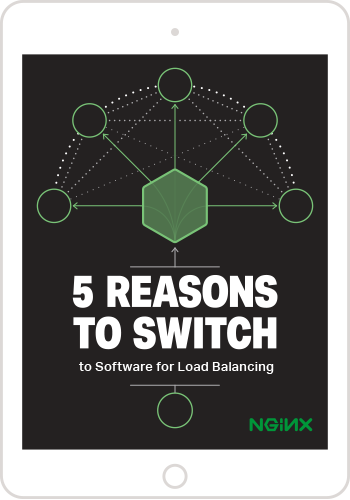 As a result, most organizations have written their own custom rules, and as they move to software‑based load balancers, whether on premises or in the cloud, they need an easy way to migrate that ADC logic along with their applications. NGINX and NGINX Plus offer a powerful configuration language that covers many of these use cases. The information in this post applies to both NGINX and NGINX Plus, but for brevity we’ll refer to NGINX Plus only in the post. NGINX Plus implements request routing with the location directive, using either a URI prefix or regular expressions to match against requests. For more detail, see the NGINX Plus Admin Guide. #> add cs policy cs_music -rule "HTTP.REQ.URL.STARTSWITH("/music")"
The following examples perform request routing based on the User-Agent header in the client request, directing requests from iOS and Android devices to separate backend application servers and traffic from all other devices to a configured application server. In the NGINX Plus map block, the $http_user_agent variable is compared to the specified regular expressions, and the $upstream_choice variable is set to the upstream group associated with the matching expression. Then the $upstream_choice variable determines which upstream group is chosen by the proxy_pass directive. #> add cs policy android_agent -rule "HTTP.REQ.HEADER("User-Agent").CONTAINS("Android")"
To redirect requests with NGINX Plus, use the return directive. It takes two parameters: the response code (for example, 301 or 302) and the redirect URL. For further discussion and more examples, see the NGINX Plus Admin Guide and Creating NGINX Rewrite Rules on our blog. To manipulate requests with NGINX Plus, use the rewrite directive. It takes two required parameters: a regular expression that matches the string to be rewritten and the replacement string. For further discussion and more examples, see the NGINX Plus Admin Guide and Creating NGINX Rewrite Rules on our blog. #> add rewrite action act_rewrite_music replace "HTTP.REQ.URL.REGEX_SELECT(re!^\/music\/[a-z]+\/[a-z]+(\/)?$!)" ""/mp3/" + HTTP.REQ.URL.AFTER_REGEX(re!^\/music\/!).BEFORE_REGEX(re!\/[a-z]+(\/)?$!) + "-" + HTTP.REQ.URL.AFTER_REGEX(re!^\/music\/[a-z]+\/!).BEFORE_REGEX(re!(\/)?$!) + ".mp3""
To rewrite HTTP responses with NGINX Plus, use the sub_filter directive. It takes two parameters: the string for NGINX Plus to search for and replace, and the replacement string. For further discussion, see the NGINX Plus Admin Guide. #> add rewrite action act_rewrite_body replace_all "HTTP.RES.BODY(100000)" ""/music/"" -search "text("/mp3/")"